France is gearing up for the national Bastille Day holiday and the World Cup final against Croatia. Authorities said they would deploy a massive police presence to ensure "peace of mind" during the festivities. French Interior Minister Gerard Collomb announced massive security measures on Friday to prevent any terror attacks over the weekend, which will see France celebrate the Bastille Day on Saturday and play against Croatia in the World Cup final on Sunday. "Everything is being done so the French can live these festive moments with peace of mind, despite the terrorist threat which remains at a high level," Collomb said. Authorities plan to deploy 110,000 police officers and gendarmes to secure gatherings across the country. Another 44,000 firefighters would also be placed on stand-by, while some 3,000 emergency medical responders would be on hand in Paris and the city's surroundings. "We cannot mobilize any more units for this weekend," Collomb said. Rain could not dampen the spirits of the French team as they lifted the World Cup trophy at Luzhniki Stadium in Moscow. They beat Croatia 4-2 in the final to win their second ever World Cup. Despite missing out on the final, Belgium were all smiles as they beat England 2-0 in the third place playoff. With the victory, the Red Devils confirmed their best ever finish at a World Cup. Mario Mandzukic, Ivan Rakitic and Ivan Perisic (from left to right) celebrate with a photographer they had just bowled over in their excitement after Mandzukic scored Croatia's winning goal in their semifinal against England. It looks like the photographer was okay. France coach Didier Deschamps embraces Samuel Umtiti after their semifinal win over Belgium. Umtiti scored the only goal France would need to reach their first final since 2006. The win means that Deschamps will get the opportunity to become just the third man to win the World Cup as both a player and a manager, having been part of the 1998 team that won the title at home in Paris. Romelu Lukaku celebrates after Belgium beat Brazil to make their first ever World Cup semifinals. The Manchester United striker delivered another brilliant performance to help his team to victory on another historic night in Kazan. England finally won a penalty shoot-out at a major tournament, thanks to Eric Dier (pictured above) and goalkeeper Jordan Pickford. After a dramatic Round of 16 game, Gareth Southgate's side made history. Nacer Chadli finishes off a swift move that started with goalkeeper Thibaut Courtois to score Belgium's third goal against Japan deep into time added on in their last 16 clash in Rostov Arena. This completed Belgium's comeback after they had gone down 2-0 in the 52nd minute. Ivan Rakitic scored for Croatia to win the penalty shootout over Denmark, which put the Balkan nation through to the quarterfinals, but it was Danijel Subasic who was the real hero, stopping three shots in the shootout. Russian goalkeeper Igor Akinfeev stopped two in the penalty shootout to send Spain packing. Here he stops Iago Aspas' effort, his second save, which sent the Cinderella host nation through to the quarterfinals. Edinson Cavani provided the two goals Uruguay would need to get past Portugal in the round of 16, but in the 74th minute he was forced to hobble off injured. Portugal skipper Cristiano Ronaldo rushed over to help him off. A sporting gesture? Perhaps. But with Uruguay in the lead, maybe CR7 was just making sure there was no time-wasting on Cavani's part. Some moments are memorable for the wrong reasons. Colombian fans would love to forget this one. James Rodriguez limps off the pitch injured after half an hour of play in his country's last group stage match against Senegal. Even without their biggest star, Colombia won the match to finish top of Group H.
Son Heung-Min wheels away in delight after doubling South Korea's lead in the dying moments of their Group F clash with Germany in Kazan. The win sent Germany crashing out in the opening round of a World Cup for the first time since 1938. A devastating loss for the reigning world champions. It all happened in a matter of seconds, but it was the moment football fans around the world had been waiting for. Ever Banega supplied the pin-point pass and, two sublime touches later, Lionel Messi was picking out the top corner with his weaker foot. After being late to the party in the group stages, Argentina's star man has a chance to make amends with France to come in the Round of 16. After having a doping ban temporarily lifted in order to feature at the World Cup in Russia, Paolo Guerrero assisted Peru's first and scored their second in a 2-0 win over Australia. It was a true captain's performance, helping Peru secure their first World Cup win since beating Iran back in 1978. Cristiano Ronaldo was at the heart of a series of VAR incidents as Portugal drew 1-1 with Iran, finishing as runners-up in Group B. CR7 had a penalty saved by Ali Beiranvand and also picked up a yellow following a review as Iran's players called for him to be sent off for an incident with Morteza Pouraliganji. A tough end to a what had been a glittering group stage campaign. Harry Kane scored a first-half hat trick for England in their 6-1 win over Panama in Group G. The Tottenham Hotspur striker already has five goals in the tournament, putting him in the running for the golden boot. Panama also made history scoring their first ever goal at a World Cup courtesy of Felipe Baloy. Toni Kroos curls home Germany's 95th-minute winner against Sweden. Despite a positive start in Sochi, the same carelessness which had been so costly against Mexico was present again, and Kroos was a major culprit. But the Real Madrid star demonstrated all his experience and class with this free-kick to spare the reigning champions' blushes. Xherdan Shaqiri celebrates his dramatic stoppage time winner over Serbia by making an Albainian eagle gesture with his hands. He and fellow goalscorer Granit Xhaka, who also made the gesture, are of Albanian descent, their families having fleed to Switzerland during the Balkan war. The pair were booed throughout by the match by Serbia fans. If Germany have it bad after their defeat to Mexico, Argentina's second match against Croatia put the giants in dire straits. Slumping to a 3-0 defeat, triggered by a goalkeeping howler, Lionel Messi and co. no longer have their group stage fate in their own hands. Messi, 30, has already "retired" briefly from international football once before; if he goes to Qatar, it surely won't be at his peak. Disgraced former FIFA president Sepp Blatter made a shock appearance as Portugal beat Morocco 1-0 on Wednesday. The 82-year-old said he was invited to the tournament by Russian President Vladimir Putin. His successor Gianni Infantino was also at the fixture, according to FIFA's list of dignitaries. "I am still president, just suspended," Blatter told Russian channel RT. Less than a month after the Champions League final, when he sustained a shoulder injury that some thought could threaten his World Cup, Mohamed Salah returned to the pitch. Liverpool's Egyptian king first drew a foul that led to a penalty and then converted from the spot. But it was a mere consolation as Egypt lost 3-1 to hosts Russia and lost their chance of progressing to the knockout stage. Harry Kane scored England's first ever second-half stoppage time World Cup goal to give the Three Lions all three points against Tunisia. Kane had given England a deserved early lead before Tunisia equalized with a controversial penalty. But captain Kane popped up again in injury time with a back-post header to win it for Gareth Southgate's team. Germany lost their first match at a World Cup for the first time since 1982, when West Germany lost 2-1 to Algeria. This time they fell 1-0 to Mexico. Joachim Löw's men were beaten by a better organized and more energetic Mexican side. Even Germany's No. 1, Manuel Neuer, couldn't prevent the defeat. Undeterred by the driving rain, Icelandic fans in Reykjakvik followed their team's first-ever World Cup match on large video screens set up in the heart of the capital. After the match, they celebrated their team's 1-1 draw with 2014 finalists Argentina as if it had been a victory. Superstar Lionel Messi and the rest of the Argentinian national team had their problems with Iceland in their opening match in Group D. The 2014 finalists could only manage a 1-1 draw, and Messi, the five-time world footballer of the year, often looked very ordinary indeed. In the 64th minute, he even failed to score from the penalty spot. Shortly before the match between Iran and Morocco kicked off, the Iranian government banned outdoor public gatherings to watch the game. In St. Petersburg, though, Iranian women, who would not be allowed into a stadium in their homeland, took the opportunity to make their view known. One of the lowest-profile opening games to grace any World Cup wasn't much of a contest. Russia were far too good for a poor Saudi Arabia side and ran out 5-0 winners. Denis Cheryshev (center) came off the bench to score the second and added another sensational strike in injury time. The opening fixture of this year's tournament between two of the world's biggest gas exporters, Saudi Arabia and Russia, was ironically dubbed "El Gasico" by some fans. Here, Crown Prince Mohammed Bin Salman Al Saud chats to FIFA President Gianni Infantino, while Russian President Vladimir Putin watches the action. Putin (second from left) also made an appearance before the opening with a plethora of footballing greats. Lothar Matthäus (far left), Pele and Maradona (center), Jay Jay Okocha (far right) and Kanu (back right) were also in attendance. More than 500 local dancers, gymnasts and performers joined pop star Robbie Williams and Russian soprano Aida Garifullina on stage at the tournament's opening ceremony. Shorter than most such events, the 15-minute-long display also featured speeches from Russian President Vladimir Putin and FIFA President Gianni Infantino. France has faced repeated terror attacks in recent years, with jihadists killing 246 people since January 2015, according to the AFP news agency. French President Emmanuel Macron is set to attend the traditional Bastille Day military parade in Paris on Saturday. Although a festive atmosphere is expected, a Bastille Day attack that killed 86 people in the southern city of Nice two years ago still casts a shadow over the national holiday. Dozens of protesters took to the streets of Nantes after police shot and killed a young man during a traffic stop. But police said the man injured an officer when he attempted to reverse his vehicle, prompting a fellow officer to fire on the driver. News of the young man's death spread swiftly, prompting protesters to take to the streets. Groups of young protesters gathered in several neighborhoods across Nantes, including Breil, Dervallieres and Malakoff. The protesters threw Molotov cocktails at police and set fire to vehicles in the area. But residents said violent incidents had been on the rise in their neighborhoods. A Breil resident told the AFP news agency that he had "heard explosions" and went to see what was happening. "I saw everything burning. There were fires in the bins, the cars. They were breaking everything. It lasted ages." Protests largely subsided by morning, according to authorities. But police are expecting "the worst in the coming days." Authorities said police in Nantes would receive reinforcements from Rennes, Saint-Nazaire and Angers to maintain order in the French city over the coming days. "I'm appealing for absolute calm, as the rule of law will be completely respected," said French Justice Minister Nicole Belloubet. 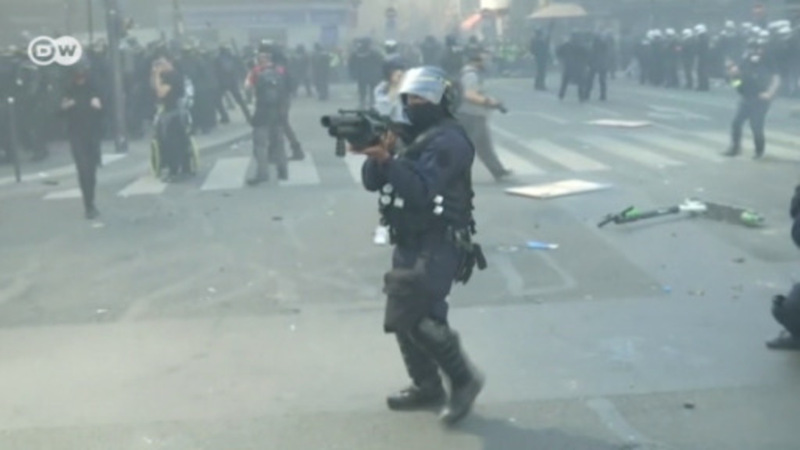 Up to 200 additional riot police officers have been mobilized, reported the Ouest-France newspaper. Officials have called for a full investigation into the young man's death, hoping to stave off further unrest. In 2005, two boys were killed while fleeing police, triggering violent protests in Clichy-sous-Bois, a low-income migrant neighborhood on the outskirts of Paris. These spread swiftly and lasted for months, becoming a major issue in the next presidential election campaign. Paris' most famous landmark, the Eiffel Tower, is closed for the weekend as authorities set up a tightly-controlled fan zone next to the monument at Champ de Mars. On Thursday, Paris police chief Michel Delpuech urged the fans to arrive "as soon as possible," adding that the police would close the zone once the limit of 90,000 people is reached. Post-game celebrations could also present additional challenges for the security forces, which monitored hundreds of thousands of revelers as they celebrated the French victory over Belgium earlier this week. Delpuech said police would respond to a victory on Sunday against Croatia by blocking off vehicle access "over a vast perimeter" around the Champs Elysees. The French are celebrating the Bastille Day with a traditional display of military grandeur, albeit with a couple of glitches. Thousands of police and gendarmes are also working to provide security behind the scenes. France have reached the World Cup final for the first time since 2006 after another set-piece goal decided another World Cup game. In Saint Petersburg, Belgium were worn down by a mature French team.